Ah, Mr Tumble. Take your finger, touch your nose, blink three times and wonder what happened to your life. Yes, I admit it. The Mr Tumble thing? I don’t get it. I’m not a fan of Justin Fletcher (sorry, Justin). Give me Mr Bloom any day of the week. Sadly for me though, the kids (and my husband, strangely) don’t share my distaste. I don’t know what it is about Something Special; the bright colours, the fact he’s a clown and does silly things, the way they’re encouraged to shout at the TV or perhaps the element of learning (it’s probably not that) but they – like small children everywhere – seem absolutely spellbound whenever Mr Tumble appears on the television. So, when I was offered the chance to review some new Mr Tumble Something Special toys from Golden Bear Toys just in time for Christmas, it was with a heavy heart and a spot of self-loathing that I agreed. The Mr Tumble toys arrived. The small one was asleep after a hard morning getting his first hair cut. This was a good thing. The constant fighting over everything new and exciting is starting to get annoying, plus, if I can sneak them out from under the big one without him seeing them, he can have them for Christmas! Winner. 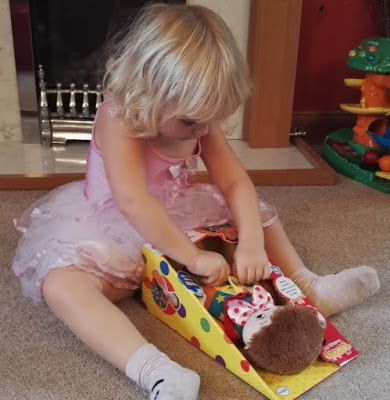 Being very insistent that we were testing the toys to see if her little brother would like them for Christmas, the big one agreed and took her role as Chief Toy Tester very seriously. 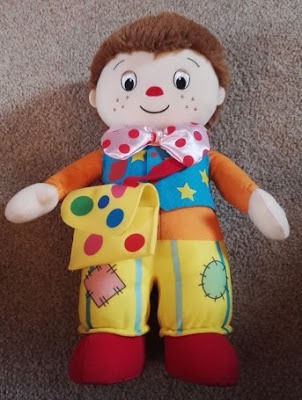 The Mr Tumble Lights and Sounds soft toy was first up. This one is aimed at younger children (suitable from ten months) but the big one who is very almost three was quite excited by it. As well as being soft and tactile, you press his hand, and he talks (see the video below) and his bowtie flashes. What’s not to love, huh? He comes with his very own spotty bag which opens and closes with velcro and a waistcoat which was pulled open and investigated straight away. It will definitely bring a smile to the small one’s face. As the name suggests, the spots are textured as well as colourful. She recognised it as Mr Tumble’s straight away. It is adjustable and comes with five Makaton sign language cards. Clockwise from top left: The Spotty Bag; Is it mine? Can I open it? ; testing to see what fits inside; looking ready for her first day at ballerina-clown school; showing me how you sign ‘sleep’ with a slightly smug grin on her face; reading the Makaton cards. This one will be much harder to prise away from her. It’s like I never learn. 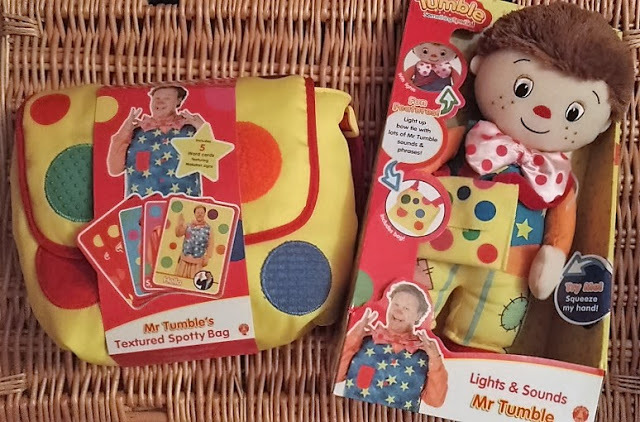 If you want to check out the Mr Tumble toys in action, we’ve delved into the murky waters of Youtube to show you what they do. 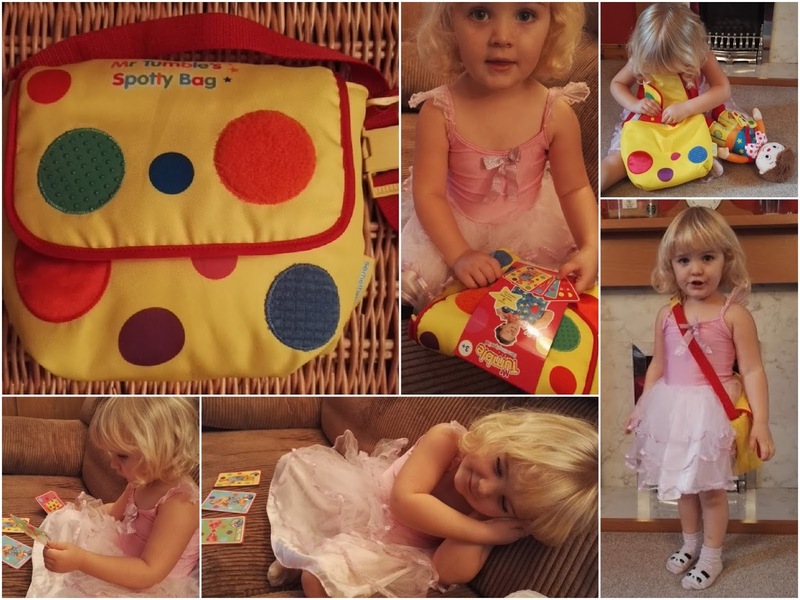 We were sent the Mr Tumble Lights and Sounds soft toy and the Mr Tumble Spotty Bag for the purposes of this review but all words are mine. You can buy the Mr Tumble Something Special toys by Golden Bear Toys from all good retailers, and on Amazon by clicking the pictures below. Mr Bloom all the way but Mr Tumble does seem to lure the kiddies (not in a dodgy way obvs). The Child would love both of those toys but I think the soft toy would be the big winner in our house. Ha Fran I'm with you on this one. Not a fan of Mr Tumble. Kinda creepy not gonna lie! Haha, her attitude "I said that Mummy" Well done for delving into the murky depths of Youtube! Look like fab toys if you like Mr Tumble. I'm with Suzanne, Mr Bloom all the way. My daughter loves him too! I do think it's amazing the work he does with so many different kids & certainly keeps her entertained. I do think the doll looks a little creepy though. My daughter would still love these even though she's a bit old for the first one. I didn't realise they did the spotty bag – genius idea.